The excellence of silence, 55dB. A collection that combines design, technology, innovation, excellence and silence. 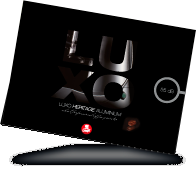 The most elegant and silent coffee grinder in the world: LUXO HERITAGE ALUMINIUM. The sophisticated and powerful injected aluminium body that possesses, hidden inside, the most advanced anti-vibration / soundproofing system in the world, only 55dB.